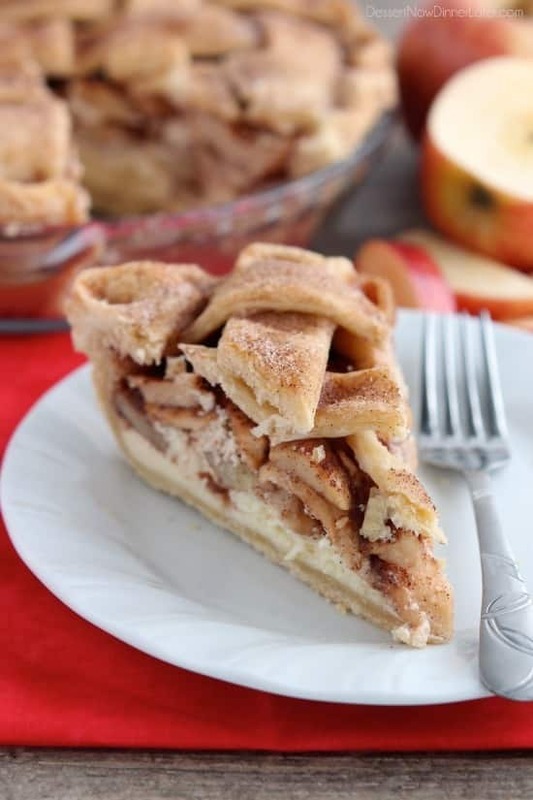 Apple Cheesecake Pie - Dessert Now, Dinner Later! We brought this to a family party and my mom and dad were ooh-ing and ahh-ing over it. 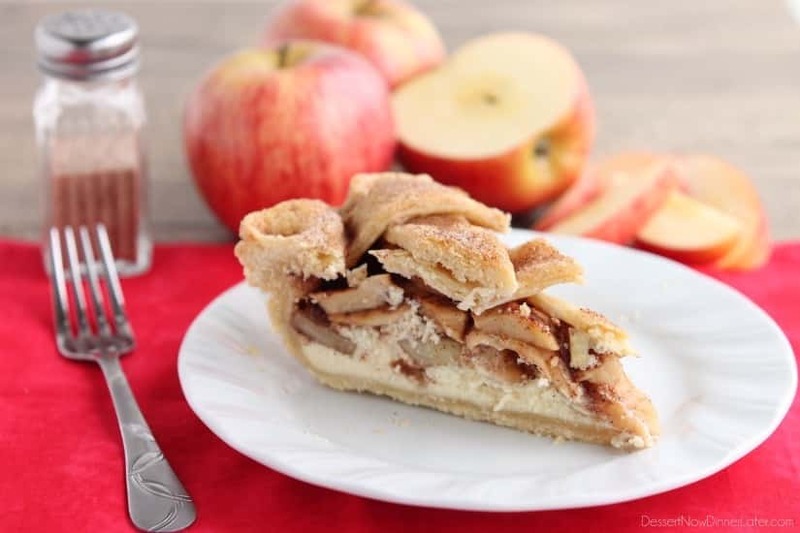 With the creamy cheesecake and tender cinnamon spiced apples, it’s incredibly satisfying! I just love a cinnamon sugar lattice top too! It’s so pretty! Unfortunately I was in a hurry when I made this, so I didn’t get step-by-step photos for a tutorial, but I can almost guarantee I will be doing one closer to Thanksgiving because I am sure there will be more pies to be made! 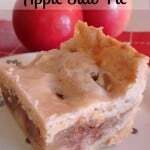 I just love apple pie any way you can make it, so if you are an apple pie lover too, give this version a try! I’m sure you’ll like it! Prepare the Perfect Pie Crust, divide the dough in half, roll out one half of the dough into a circle, and place it inside a pie dish. Cut off excess crust on the edges. Keep the other half of the pie crust covered so it doesn't dry out. In a small bowl with a hand mixer, beat the cream cheese and sugar until creamy. Beat in the egg until smooth. Spread onto the bottom of the prepared pie crust. 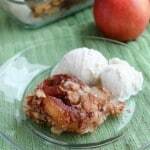 In a large bowl, combine apples, lemon juice, sugar, cinnamon, nutmeg, and cornstarch. Toss to coat and then GENTLY spoon the apples and their juices onto the cheesecake layer. Lightly wet the edges of the pie crust in the dish with a little water on your fingertips. Roll out the other half of the pie crust dough, cut it into ten 1-inch strips, and weave a lattice top over the pie with five strips criss-crossing and weaving over and under the other five strips. Cut off excess dough and crimp edges. Sprinkle the top generously with cinnamon-sugar. 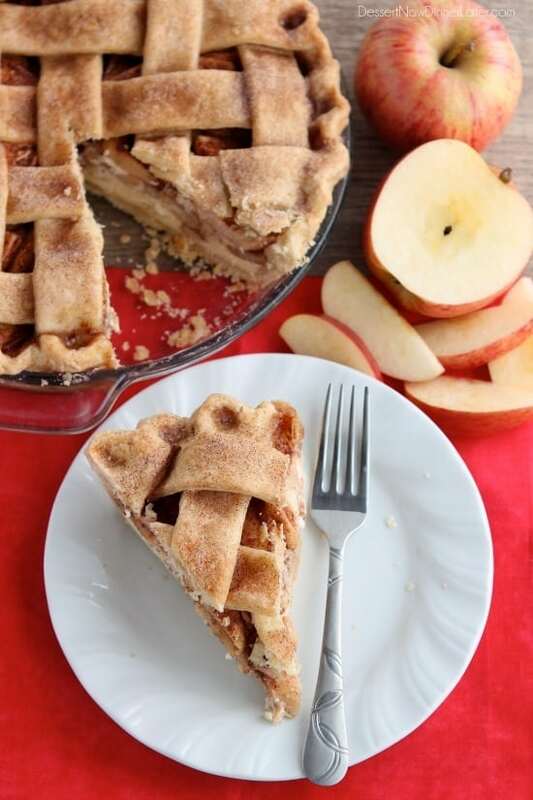 Bake at 350 degrees Fahrenheit for 60 minutes or until crust is baked and the apple pie filling is bubbling in the center. Allow to cool completely before serving. Keep refrigerated. Cheesecake in a pie?! I think my husband would just about die! Looks heavenly! And I love how you sprinkled the top with cinnamon-sugar. Yum! I know, ridiculous right?! It’s a delicious fusion of desserts! Thanks for stopping by Melanie! Two of my favorite things combined in one. Apple pie and cheesecake! This is a win! It was fabulous! Two of my faves as well! 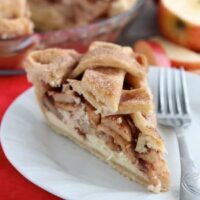 I love apple pie and cheesecake just puts it over the top for me, Pinned! Fun combo right?! Thanks for pinning! I love creamy pies! 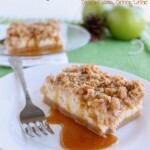 Great idea to combine cheesecake and apple. I will add cream cheese to anything I can! And thanks for sharing on FB! I am totally craving a slice of this pie right now.. looks and sounds amazing! Thanks! I can’t wait to make it again! Aw, thanks Kelly! You’re so sweet! 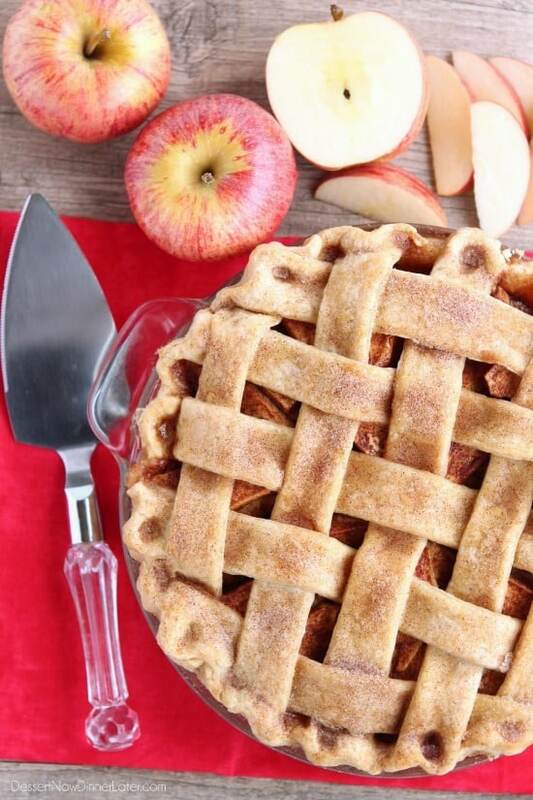 This pie is SO gorgeous, Amber! 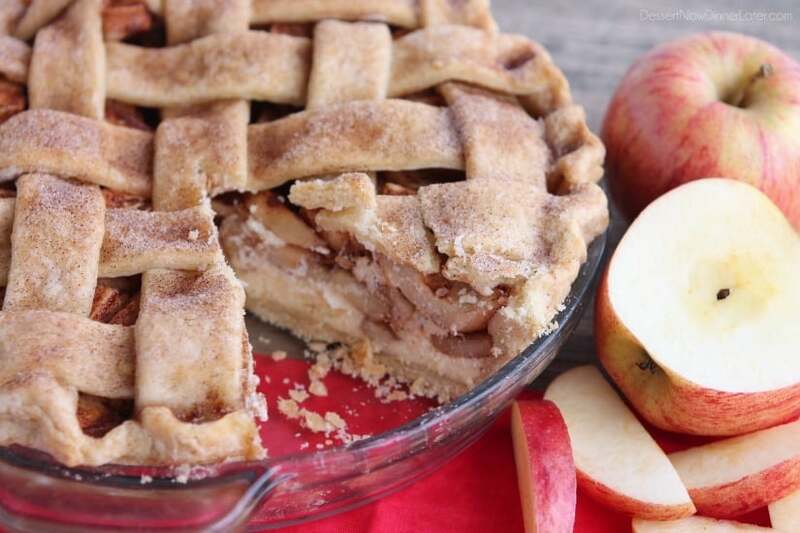 Apples and cheesecake sounds like the best fall combo EVER and your lattice crust is mind-blowing stunning! Love all the cinnamon sugar sprinkled on top! 🙂 Pinned! Thanks Sarah! I will hopefully be doing a tutorial for the lattice crust here soon! 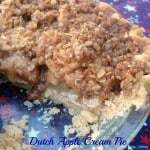 Wow – that pie is gorgeous Amber, and looks delicious!! One slice will do you in, that’s for sure! It’s a good one! Do you think this will last if I make it tomorrow and keep it in the fridge until Thursday? I imagine it will, I just want a second opinion for peace of mind! I’m sure it will be just fine! Just like refrigerating any other pie or cheesecake. Enjoy! Happy Thanksgiving! Happy Birthday on Pi Day! Glad you liked it! Hi Amber, I was wondering if this would work with mixed berries as well. I think that would be awesome!! That’s great! Thanks for sharing your experience Gabi!